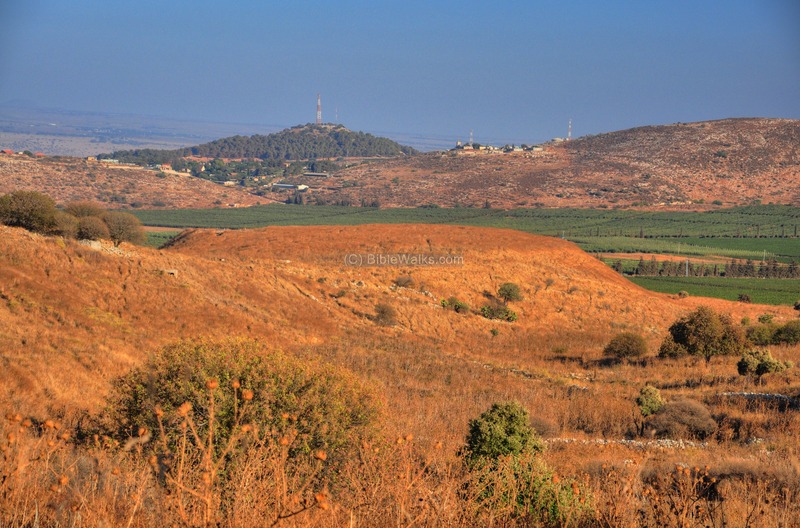 One of the largest and most important ancient mounds in the Galilee. Inhabited from the Bronze age to the Roman period. It was one of the six Biblical refugee cities named by the Bible. Recent excavations focus on the Persian/Hellenistic period. Joshua 20, 2,7: "Speak to the children of Israel, saying, Appoint out for you cities of refuge... And they appointed Kedesh in Galilee in mount Naphtali". 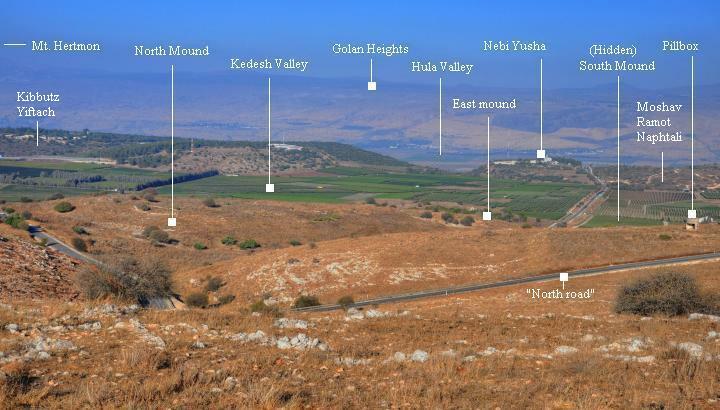 This is an overview page of Tel Kedesh, one of the largest and most important ancient mounds in the Galilee, which was inhabited from the Bronze age to the Roman period. It was one of the six Biblical refugee cities named by the Bible. The southern mound is excavated since 1997, but years will take to unveil its secrets and fascinating history. The ancient Biblical mound (which was inhabited until the Hellenistic period) is quite large - 900 m from north to side, with a total size of 20-25 acres (80-90 dunams). The North side of the ancient mound is at 485m above sea level, almost 100m higher than the plateau of the Kedesh valley around the site (395m). The mound is protected by high steep walls, which was an artificial glacis wall that protected the city. Ruins of the Roman period village, located on a lower eastern hill, is at altitude of 434m. 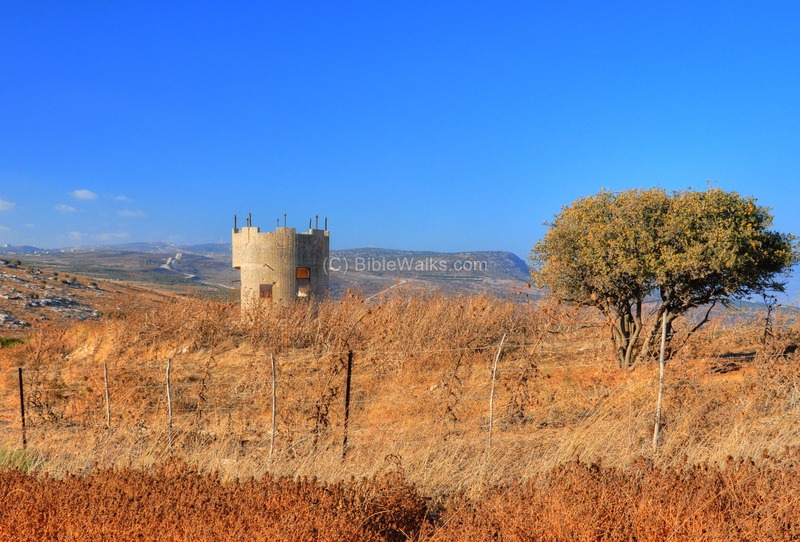 Tel Kedesh is located about 500m east of the Israeli-Lebanese border. The "North Road", so called since it trails the northern border of Israel, passes between the mounds and then winds around the north mound, continuing to the west. 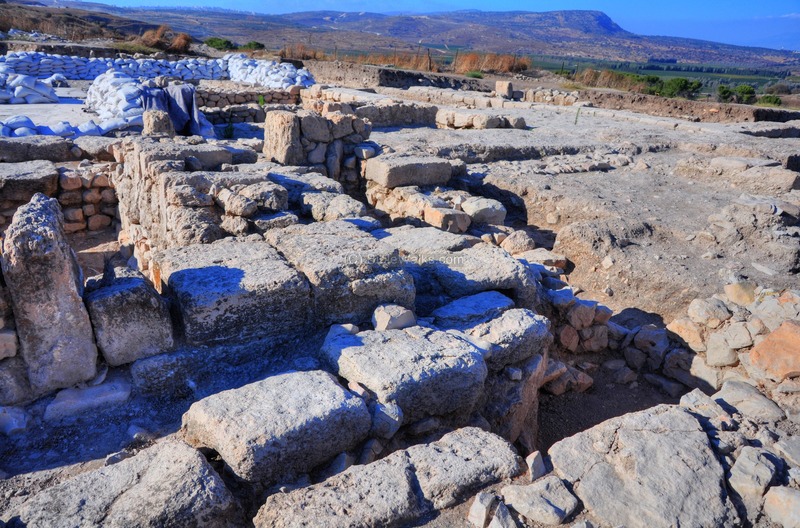 Tel Kedesh is 6 miles away from the largest ancient site in the region - Tel Hazor - which is located on the south of Hula valley. 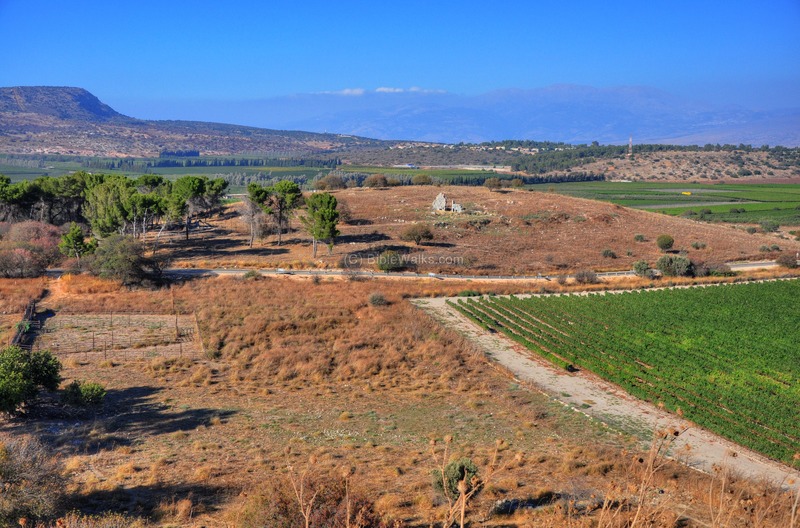 The plateau of the Kedesh valley towers over the Hula valley on the east (a 330m descent), once a large lake, which was dried out in the 20th C.
Early Bronze period: The city was established during the Early Bronze age (3150-2200BC), at about the same time the nearby cities of Hazor and Dan. Middle Bronze period: The city expanded and transformed into a large Canaanite city/state in the Middle Bronze IIa period (20th-18th C BC). At that time, parts of Canaan and the Phoenician shore were under the Egyptian rule, a rising empire which was at its peak. Kedesh, Hazor and Laish (Dan) are among the 64 cities referenced in the 19th C Egyptian (12th Dynasty) enemy-curse clay tablets ("execration texts") as "Zbl-Hadad". Late Bronze: Egypt conquered Canaan in the 16th Century BC, during their struggle against the Hyksos invasion to Egypt. In the second half of the 15th C BC a coalition of Canaanite cities, headed by Megiddo, mutinied against the Egyptian rule. The Egyptians crushed this attempt in the famous battle near Megiddo (1468 BC), which resulted in the Egyptian re-conquest of Canaan for another 350 years. A total of 119 cities were listed on tablets in the Egyptian temples as the conquered and enslaved cities. The city of Kedesh is not explicitly listed as one of the cities that were conquered by Egyptian Pharaoh Thutmose III . However, the region of "Galil" in that list may have referred to the city of Kedesh. The Canaanite cities continued to try to disengage from the Egyptian rule. 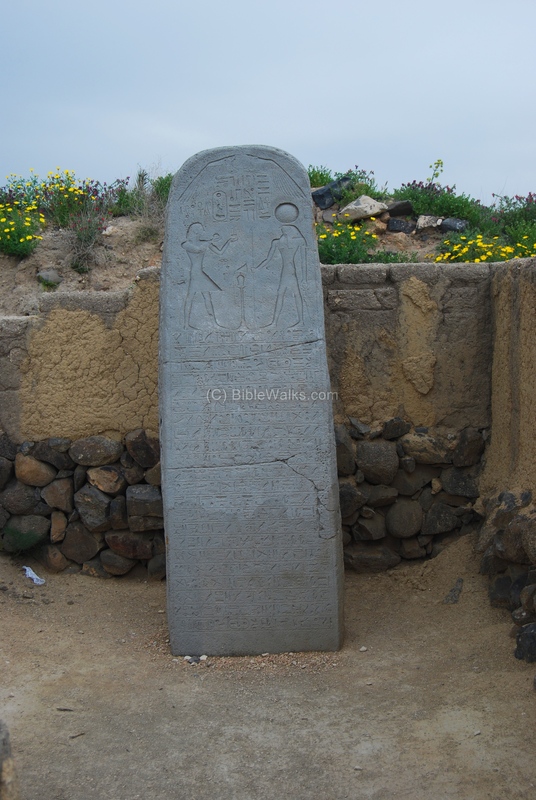 An Egyptian basalt stele dated to 1318BC was found in 1928 on Tel Beit She'an (see photo on right). It commemorates another Egyptian military victory during the reign of Pharaoh Seti I (~1294-1279 BC) who quelled the rebellion. At that time a coalition of several rebelling cities attempted to seize the headquarters in Beit She'an, and were crushed by the Egyptians. One of the listed cities was Kedesh. Conquest of Canaan (13th C): The Israelite arrived from Egypt in the 13th C BC, taking the land of Canaan by force. According to Joshua, they also captured Kedesh (12:1, 22): "Now these are the kings of the land, which the children of Israel smote, and possessed their land ... The king of Kedesh, one; the king of Jokneam of Carmel, one;". The new Israelite city in Kedesh was assigned to the tribe of Naphtali ( Joshua 19 32-37): "The sixth lot came out for the children of Naphtali...and the fortified cities were ... Hazor; and Kedesh, and Edrei, and En-Hazor;"
The tribe of Levy settled among the other tribe regions and had religious and political duties. This text lists the cities and areas where the tribe of Levy was located, which included Kedesh; furthermore, the city received a special status of a refugee city for cases of random killings (Joshua 21 3, 32): "And the children of Israel gave unto the Levites out of their inheritance, according to the commandment of HaShem, these cities with the open land about them.... And out of the tribe of Naphtali, Kedesh in Galilee with the open land about it, the city of refuge for the manslayer". The refugee status was explained in the next chapter (Joshua 20 1-3,7): "The LORD also spake unto Joshua, saying, Speak to the children of Israel, saying, Appoint out for you cities of refuge, whereof I spake unto you by the hand of Moses: That the slayer that killeth any person unawares and unwittingly may flee thither: and they shall be your refuge from the avenger of blood...And they appointed Kedesh in Galilee in mount Naphtali". The suffix of Galilee in mount Naphtali was added since there were other cities with the name Kedesh. A map of the area around Kedesh, from the Canaanite/Israelite period to the Roman period, is seen in the map below. 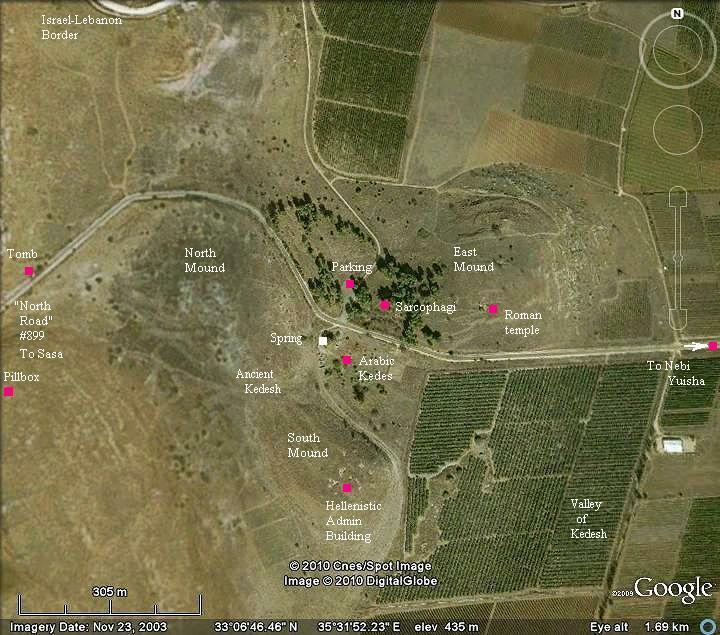 Kedesh is marked in the center of the map, west and above Lake Hula. It is located on the route of a major road from Hula valley to the coastal city Tyre via Tibnin. Judges period (12 C): Kedesh-Naphtali is mentioned in the battle of Deborah and Barak as the birthplace of the military leader Barak (Judges 4) "...Barak the son of Abinoam out of Kedeshnaphtali".. However, some scholars identify this Kedesh as the small village on the south-west side of the Sea of Galilee (near Pori'ya). Saul and David (11th C): The city was part of the great Israelite Kingdom, but there are no specific references to it. After David the Kingdom split, and Kedesh was part of the Northern Kingdom. Northern Kingdom (10th-8th C): The Northern Israelite Kingdom faced a problem from the north. The rising power of the Kingdom of Aram-Damascus sparked a conflict during the 9th and beginning of the 8th C BC, which affected the city of Kedesh. 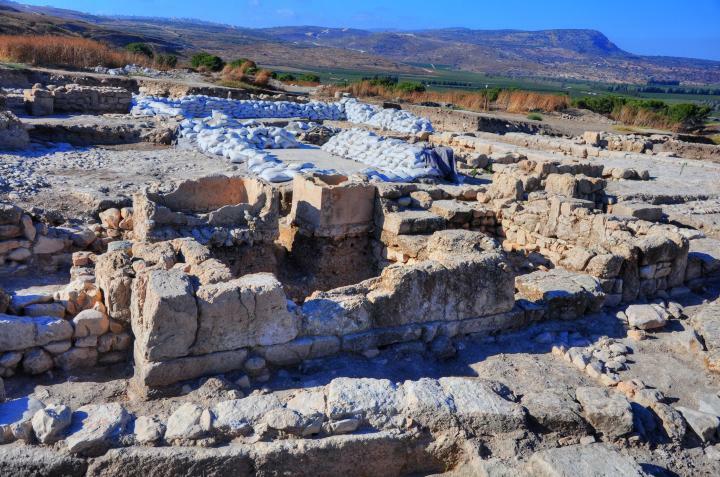 During the 9th C BC the Israelite city may have been damaged, as found in other cities in the region, such as Dan which was burnt to the ground. This was the result of the intrusion of of Syria's Ben-Hadad (885BC) along the North Jordan valley (1 Kings 15 20): "So Benhadad hearkened unto king Asa, and sent the captains of the hosts which he had against the cities of Israel, and smote Ijon, and Dan, and Abelbethmaachah, and all Cinneroth, with all the land of Naphtali". This destruction was also recorded in the excavations of Hazor as well as other sites in the area. The Kings Omri (882BC) and Ahab (855-850) reinforced the northern cities, such as Hazor which was doubled in size and new walls were added. After several clashes, King Ahab successfully pushed the Syrians out and Ben-Hadad was forced to make peace with the Israelites. Assyrians (8th -7th C): The Assyrians captured the Galilee (732 BC), and destroyed Kedesh (2 Kings 15:39): " In the days of Pekah king of Israel came Tiglathpileser king of Assyria, and took Ijon, and Abelbethmaachah, and Janoah, and Kedesh, and Hazor, and Gilead, and Galilee, all the land of Naphtali, and carried them captive to Assyria". Kedesh came under the Assyrian control, with Megiddo the capital city of the Galilee province. The Assyrian empire lasted until the end of the 7th C, replaced by the Babylonians and later by the Persian empire. During the empire switchover, the Judean King Josiah (628 to 609BC) seized the moment and expanded the Kingdom to the Upper Galilee (2 Chronicles 34 6): "And so did he in the cities of Manasseh, and Ephraim, and Simeon, even unto Naphtali,...". This was the greatest times for the Judean Kingdom, which lasted for a short time, and Josiah was killed in a battle at Megiddo. The Babylonians destroyed Judea in 587. Persian period (6th C): The Great Persian empire controlled many parts of the the ancient world from 538 to 332BC. During this time they rebuilt Tel Kedesh. Recent excavations (2008-2010) focused on a large administration building on the south side, which is dated from the 5th to the 3rd C BC. The city may have been a capital for the Upper Galilee province. The Hellenistic period is characterized with wealth and growth in trade and construction. On Tel Kedesh, the Persian administration building was rebuilt, and was excavated in 2008-2010. 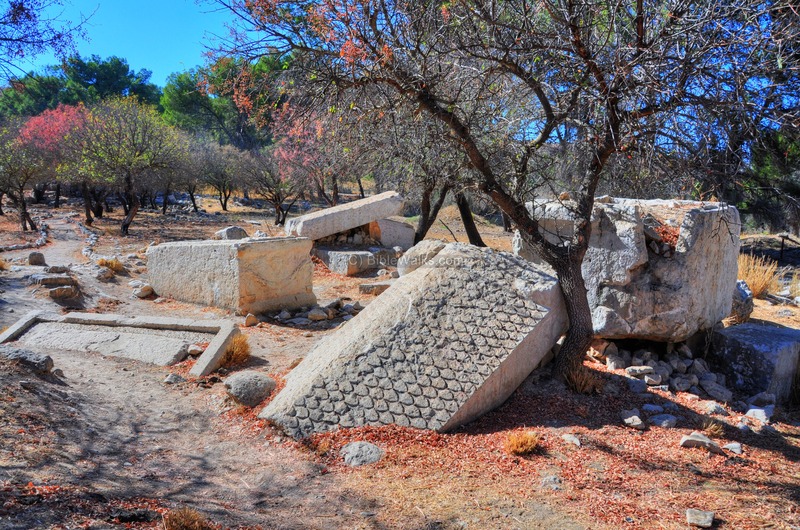 Kedesh is referred in several writings, such as the merchant Zenon (259BC) who purchased flour and took a bath, describing it as a flourishing village. The Jewish Hasmonean Kings reached the Upper Galilee in the second half of the 2nd C BC. In 144/5BC Jonathan and Demetrius II clashed in Hazor, and the Hasmonean army chased the Seleucids up to Kedesh, where they captured their camp (1 Maccabee 11: 63, 73): "Jonathan learned that the officers of Demetrius had come to Kedesh in Galilee with a large army ... They chased the enemy all the way back to their camp at Kedesh and then took over the camp". This source tells us that the site was abandoned after the Jewish victory. This was also evident in the archaeological probes and the excavations of the administration building on the southern mound. 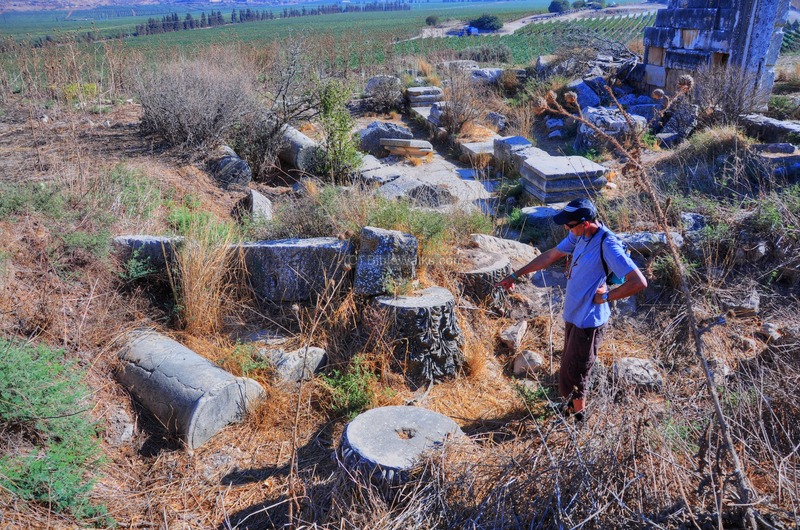 Although people moved into the ruins of the city after the Hasmonean conquest (between 144/5 to 130BC), this section was not longer in use after this transition period. The center of the city moved after this time to the eastern mound, and so the ancient double-mound Tel remained in ruins since then. The eastern mound became a Tyre stronghold in the 1st C BC and the 1st C AD (early Roman period), as described by Josephus Flavius. Kedesh, now called Cadasa (or Cadisos), was an important Roman city during the 3rd C-4th C. The ruins of the impressive pagan temple and decorated sarcophagi seen today on the eastern mound attest to the wealth of the Roman city. During the great revolt against the Romans (66AD), Titus camped near Kadesh (Cydessa), and Josephus explains why (Josephus War IV, 2 3): "Titus was prevailed with by this pretense for a delay, and that he pitched his camp further off the city at Cydessa. This Cydessa was a strong Mediterranean village of the Tyrians, which always hated and made war against the Jews; it had also a great number of inhabitants, and was well fortified, which made it a proper place for such as were enemies to the Jewish nation." Except for a short time of occupation during the Crusaders period (12th C), the city was in ruins from the 7th C until the 19th C.
The site was examined in the PEF survey (1866-1877) by Wilson, Conder and Kitchener, who also photographed the Roman temple, mausoleum and other features. The mausoleum was at that time preserved to roof level, and unfortunately it was destroyed later by the local villagers. The site appears as "Kades" in the center of the valley of Kades, as seen on the map of 1880, north-east of the village of el-Malkiyeh. At that time, it was a "mud and stone village". In the 1930s the British decided to seal the border between the British mandate of Palestine and the French mandate in Lebanon and Syria. They paved a road (named the "North Road"), added a fence, small fortifications ("pillbox") and eight fortified police stations ("Tegart"), named after British police officer and engineer Sir Charles Tegart who designed them. 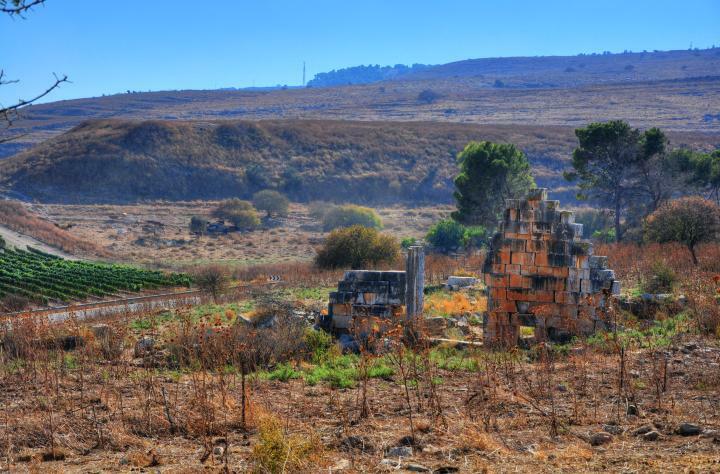 One of the Tegart forts was constructed on the east side of the Kedesh valley, on the route of the descent to the Hula valley, in a small Arab village called in Nebi Yush'a. During the independence war (1948) the Arab forces seized the fort. 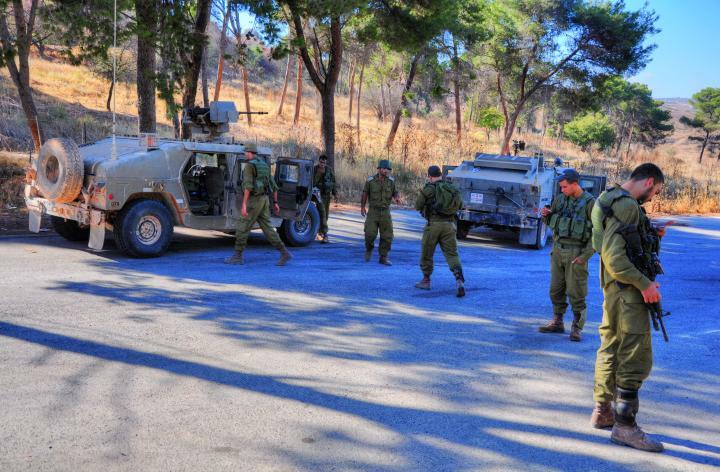 The Israeli forces managed to capture the police station after two bloody attempts (April 20, May 17), with a total of 28 casualties. This gave the fortress its name - Metzudat Koach - named after the 28 fighters (the numerical value of the Hebrew letters Kaf-Chet of '28' spells Ko'ach, meaning: strength, so the fortress name means "fort of strength"). Excavations in Tel Kedesh started in 1997, managed by members of the University of Michigan and University of Minnesota. Recent dig years are co-directed by Professor Sharon Herbert (Univ. Michigan) and Professor Andrea Berlin (Univ. Minnesota), and focus on the Persian-Hellenistic administration building on the south-east corner of the ancient Tel Kedesh. The site is open to the public and is a national park since 1999. There is an easy access to the eastern mound, with a parking lot located at the entrance to the trail. You can also walk to the southern mound via a trail that crosses the Kedesh spring. A view towards the east is seen below. 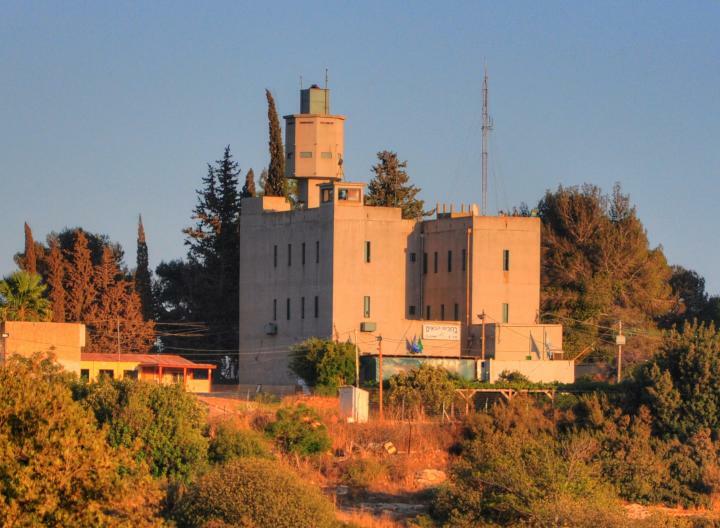 Tel Kedesh is located behind the center hill. Beyond the hills stretches the fertile Kedesh valley (3km by 1.5km), which is a special geological phenomenon where a whole area sank following a karst process — the chemical dissolution of the rocks - due to the collapse of underground cavities. Behind the valley is the deep depression of the Hula valley and the higher Golan heights above the valley. The major sites in this view are indicated below. 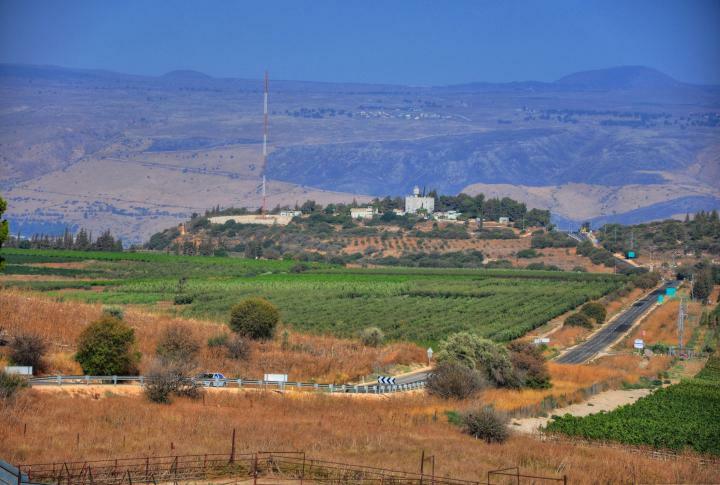 On both edges of this view are two new settlements - Kibbutz Yiftach on the left (established in 1948) and Moshav Ramot-Naphtali on the right (established 1945). You can point on the white squares to navigate to the selected point. The eastern Tel Kedesh is located on a low hill to the north of the southern mound, on the side of the road from Nebi-Yush'a. This was once a Roman period village, where the city relocated after the ancient Tel ceased to function following the 2nd C BC. An open parking lot (hidden beyond the pine trees on the left side) provides an easy access to the hill. 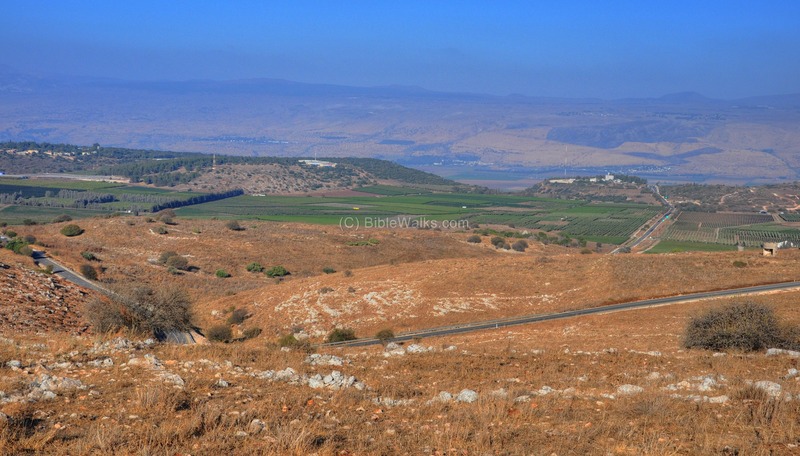 The view below is towards the north, with Mt Hermon in the center of the far background. Ruins of a Roman pagan temple, dated to the 2nd and 3rd C AD, are located on the southern side of the eastern mound, easily accessed by a trail from the parking lot. It was dedicated to the Syro-Phoenician god Baal-Shamin. In the south view below you can see the southern ancient mound in the background of the photo, towering above the Kedesh valley. Sections of the eastern wall of the temple is still standing high, built of well dressed large ashlars. The original height is estimated at 11m high, which makes it one of the most impressive Roman temples in the land. The entire temple (30m by 18m) was surrounded by a wall. 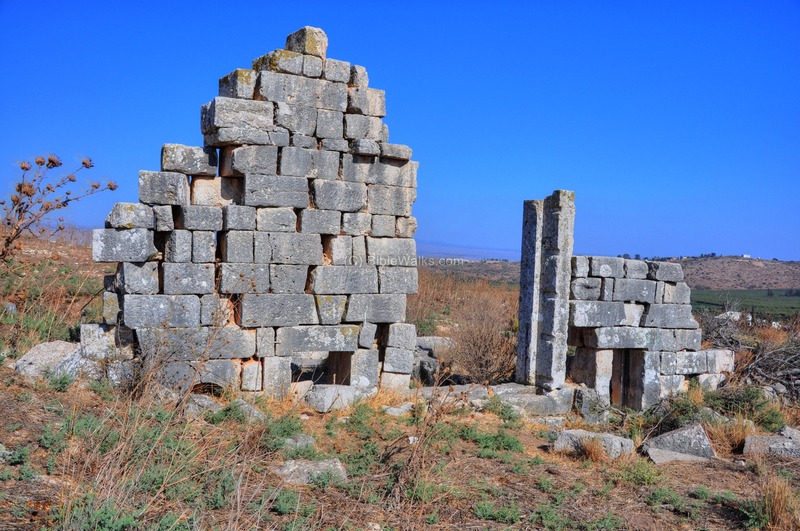 On the eastern side of the wall are fragments of pillars and other architecture elements of the temple. 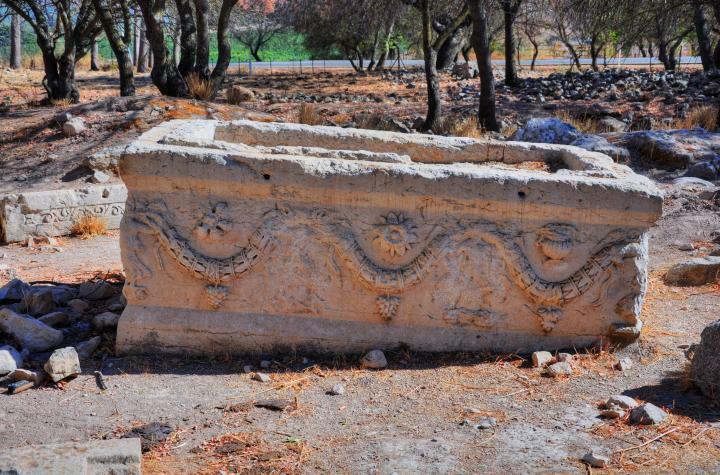 Another unique highlight of the site are a number of huge sarcophagi located near the entrance to the park. This decorated stone coffin, one of the several laying around, is unusual - it has two cavities, with head positions in opposite directions. A sarcophagus (sarcophagi in plural) - in Greek - means "flesh eater". It is a stone coffin, intended to be a multiple use box that contained the body of the deceased for the first phase. After the flesh decomposed the bones were removed to a smaller container or pit, allowing the next member in the family to be placed in the coffin. Ruins of a Roman mausoleum are located near the parking lot, with its large ashlars scattered around. 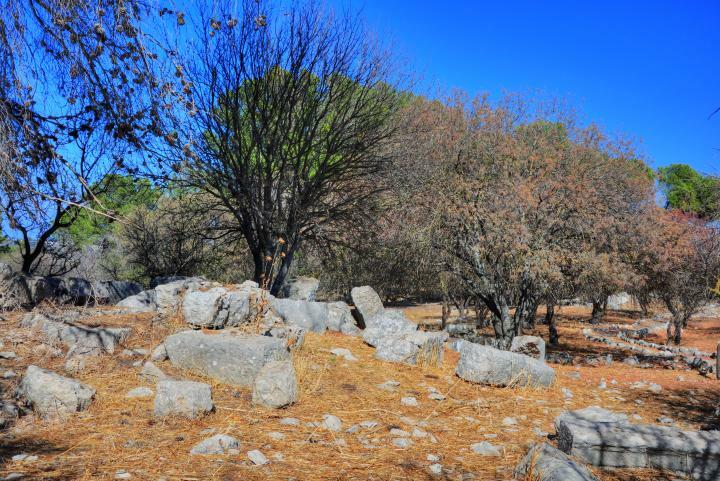 Notice that some of the trees in the national park are burnt, evidence of the fires that broke up after the bombardment from Lebanon during July 2006. 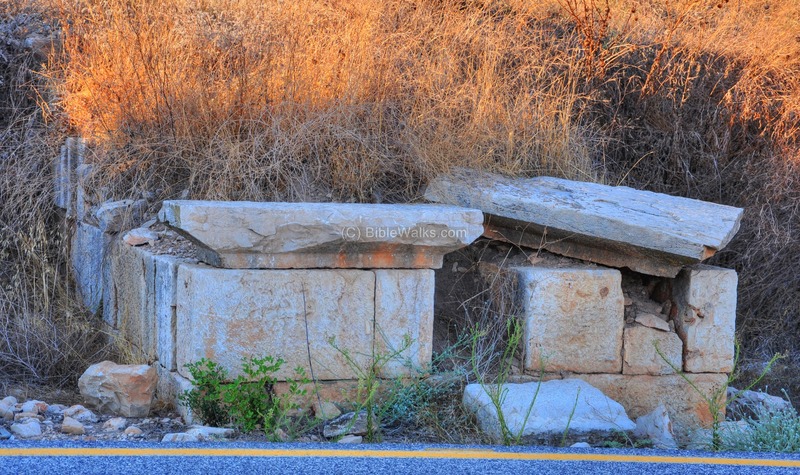 More info and photos on the Roman city in Kedesh - see our detailed page. The southern mound is seen from the west in the picture below, with a section of the northern mound on the left. 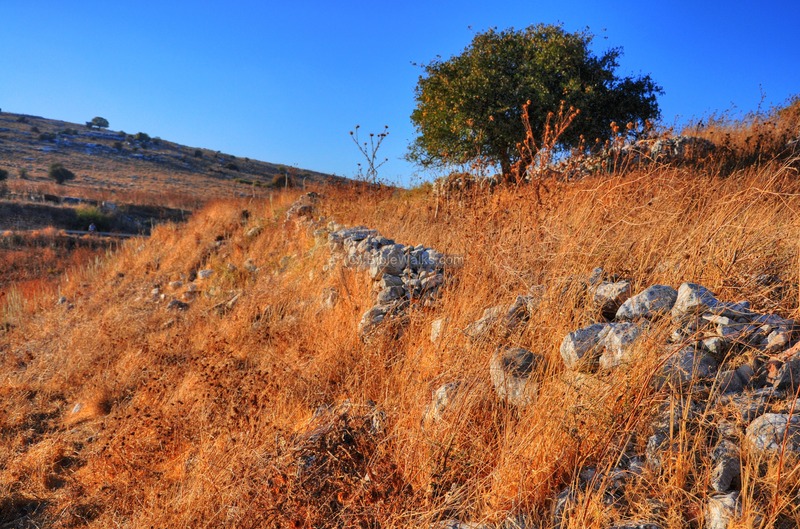 It has very steep wall all along its sides, which was once a glacis wall that protected the Canaanite city. A large Persian/Hellenistic Administration building ("PHAB") was the focus of the recent years. Its ruins are seen in this north view. The building was built in two periods - the Persian period (5th to 3rdC BC) and - on top of it - the Hellenistic period building (3rd to 1st C BC). After the Hellenistic period the city relocated to the eastern hill, and so this was the latest major archaeological layer at this location. More information and photos on these excavations is provided in the "Biblical city" page. On the north-west side of the hill, adjacent to the road, are remains of a monumental tomb. A small Arab village once existed on the east side of the northern mound, until its residents evacuated to Lebanon in 1948. Its name - Kades (Qades) - preserved the ancient Biblical Hebrew name with a small variation. 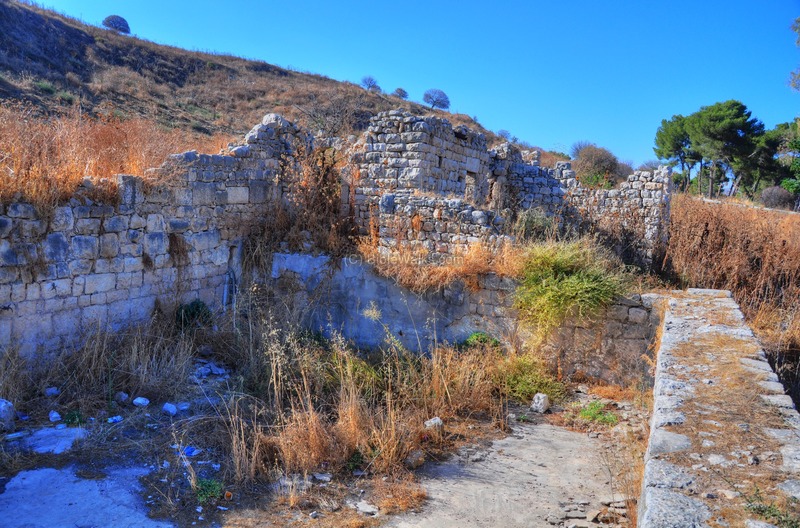 Only few of its 56 houses remained standing in ruins, such as this one near the foothills of the mound and adjacent to the Kedesh spring. The waters from the Kedesh spring, located behind this building, filled up the pool. This spring dries out in the summer time, so the reservoir was used during the dry season to water the animals and the trees on the bottom of the valley. A smaller Arab village (with only 12 houses) existed on the hill at the edge of the Kedesh valley, named Nebi Yush'a - meaning "prophet Joshua". The ruins of this village are located on a hill which is positioned in a strategic place - the junction of roads to Zephat and Manara, and the beginning of the "North road" which descends to the Hula valley below. The British constructed a large fortified police station ("Tegart") in 1938, one of the eight stations along the northern border. The fortress protected the road to the valley and its compound was used as residential quarters for the policemen. During the independence war (1948) the Israeli forces managed to capture it from the Arabs after two bloody attempts (April 20, May 17), with a total of 28 casualties. 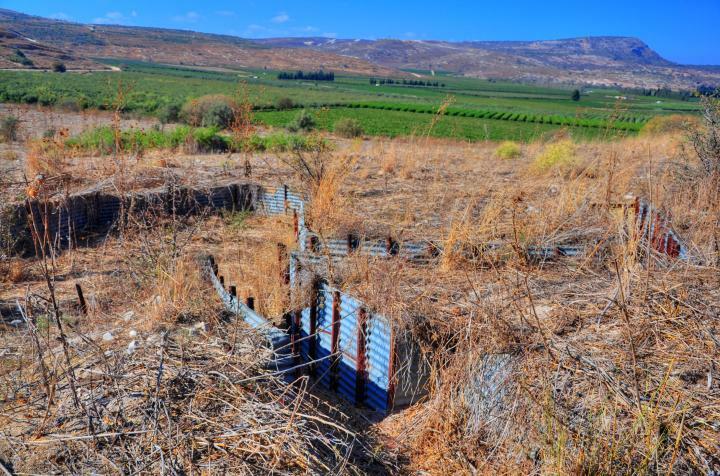 The site is located 0.5KM from the border with Lebanon. The border was marked during the 1920s by the British, who protected the northern side of the country with fortified forts (built in 1938). One of these British fortifications are located above Tel Kedesh, and is nicknamed by the common word "pillbox" - a small rounded fortified post which resembles a box of pills. It guarded the "North road" - the military route along the border. Fortifications from the Independence war (1948), and the years following it, are scattered around the site. These include trenches, command posts and bunkers. A series of such abandoned trenches are seen below, located on the north-east side of the eastern mound. The modern border line is located along the foothills in the background. The Israeli army protects the region and patrols along the border, making it safe to explore the site and enjoy the beauty of the area. Malkiya - A kibbutz near Kedesh, established in 1949. Named after the family of priests who served in the temple (1 Chronicles 24 9: " ...the fifth to Malchijah" ) who moved here after the destruction of the temple. Malkiyeh - Arab village destroyed in 1948. Preserved the ancient name of Malkiyah.